Generations of students, faculty, staff, and alumni have enjoyed the beauty, solitude, and comfort that comes from a walk through The Grove on a spring day, or a tailgate party on a football weekend that bonds families, friends, and colleagues. The Grove is more than a gathering place. It’s a classroom, a park, and an auditorium. But mostly, it’s a beloved sanctuary of wonderful memories. The Grove is truly a unique place. And for this reason, The Grove Society has been established to provide a means for continued support. The Grove Society is a membership organization dedicated to preservation of The Grove and its role in the life of Ole Miss. 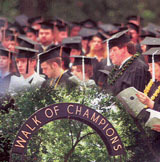 Funds derived from membership provide for the maintenance and upkeep of The Grove and for costs associated with sports activities as thousands visit the campus each year. For an annual contribution of $1,500, Founders will receive designated parking for each home football game (check availability), a personalized parking permit, and a special auto decal. 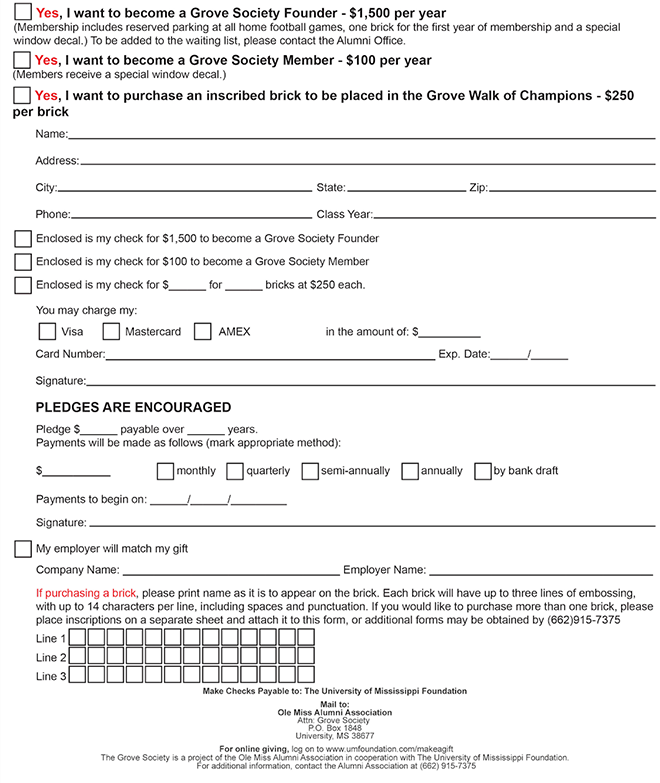 For the first year of membership only, Founders will receive one brick in The Grove Walk of Champions. For an annual gift of $100, members receive a special Grove Society window decal.